Surface active cleaning agent, and/or radioactive decontaminant, for laboratory, medical and industrial applications. Supplied as a liquid concentrate, for dilution with water. For ‘manual’ cleaning, or for use in an ultrasonic cleaning bath. A mixture of anionic and non-ionic surface active agents, stabilising agents, non-phosphate detergent builders, alkalis and sequestering agents, in an aqueous base. Supplied in 1 litre, 5 litre and 20 litre high density polyethylene containers, with "tamper-evident", screw-on caps. For cleaning and/or decontaminating glassware, ceramics, rubbers, most plastics, stainless steel and ferrous metals. 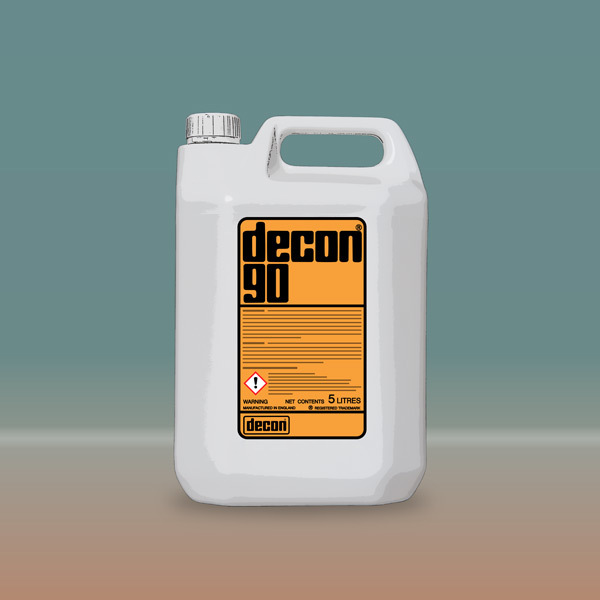 Prepare a 2% to 5% solution of Decon 90 with water†. Fully immerse the items to be cleaned and soak for 2 to 24 hours, depending upon the degree and tenacity of the soiling. The cleaned items must be rinsed thoroughly as soon as they are removed from the cleaning solution, and dried. We recommend three agitated rinses in water† to ensure removal of all traces of contamination and cleaning agent.